Enjoying reading his books and philosophical inquiries for years it was a big pleasure and even a greater honor for me to interview Mario Bunge. Mario Augusto Bunge is one of the few extraordinary personalities who have managed “to essentially shape the intellectual geography of an era of science”. Mario Bunge is a member of the small circle of important philosophers of science whose works have become “milestones in the life of the spiritual landscape of world philosophy”. Born in Buenos Aires in 1919, Professor Mario Bunge earned his doctorate in physico-mathematical sciences from the National University of La Plata in Argentina, and has been a professor of theoretical physics and of philosophy. 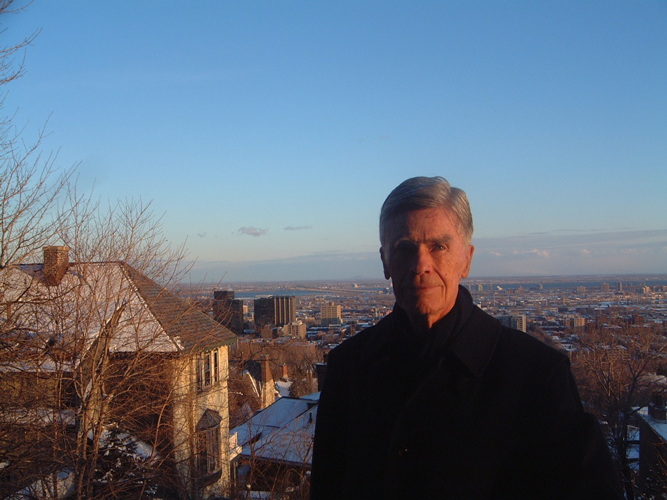 He joined McGill University in 1966, was given a named chair, and was recently made an emeritus professor. He has also been a visiting professor in numerous countries including the USA, Denmark, Germany, Italy, Mexico, Switzerland, and Australia. Professor Bunge holds 19 honorary doctorates and four honorary professorships, is a member of four academies and a Prince of Asturias laureate, and ranks #43 in the AAAS’ Science Hall of Fame. He has authored over 400 papers and more than 80 books on quantum theory, philosophy of science, semantics, epistemology, ontology, ethics, political philosophy, and science policy.
? – How is the value of philosophies to be assessed? Do you think that good philosophies must be useful, or perhaps have even to pay off? In my view, philosophies can be good, bad, or indifferent, according as they help, obstruct, or do neither to the advancement of knowledge. The reward is not pecuniary but cultural. For example, the French Enlightenment favored the advancement of science and technology, whereas phenomenology and existentialism obstructed it, and Wittgenstein’s linguistic philosophy did not solve any problems of knowledge because it focused on words. In any case, the rewards and punishments are cultural, not pecuniary. However, this is not to approve of academic mercenaries, like the Catholic and Marxist philosophers who taught what the powers that be ordered them to teach. Original philosophy is always “deviant” or even subversive. Remember that Thomas Aquinas’ teachings were initially condemned as heresies by the Church. performance criteria: What do your colleagues think of this kind of pragmatism? Most philosophers today avoid taking firm stands on anything. They find that it is safer and more rewarding to write comments on commentators than to invent new ideas. Most contemporary philosophers are conservative and eager to keep their jobs. They seem to have taken the function of an aesthetic and intellectual window dresser making it less painful for us to look at a harsh, in their eyes unchangeable world.
? – Is it true that philosophy actually has lost her “kingdom”? Are philosophers today like that person, that was once immortalized by Paul McCartney in a Beatles song – are they “fools on the hill”? Are there any important skills philosophers have that other cultural or key personnel does not own? That is very true. Even philosophies who have denounced pseudosciences like psychoanalysis, have condoned pseudoscientific economic theories like neoclassical microeconomics. It is far safer and easier to criticize Freud and Jung than to criticize Milton Friedman and Friedrich Hayek, because the latter are backed by political movements whereas the former are not. Much the same holds for Creationist cosmologies and “intelligent design”: anyone who writes in favor of them can hope to get a Templeton Prize or at least subsidy.
? – Obviously, philosophy is not a uniform field. There are philosophical paradigms that compete with each other. The more important it seems to be to learn to recognize philosophical competence. Philosophical competence is hard to judge, and at any rate philosophical juries are very different in different cultures. In my view, a competent philosopher is not an erudite but one who proposes valuable insights about interesting problems – just as in science and technology. In the scientific community you find competent teachers and original researchers, just as in the musical community you find many good performers but very few good composers.
? – How convincing are competent philosophers in situations in which they have to discuss their arguments? Are the best of them able to win an “elevator pitch” by getting across their messages in 120 seconds? Sorry, I don’t understand the question. In any event, I don’t believe in instant philosophy, because interesting problems take a long time to understand and work out. Just think of the problems of truth and justice. The Big Questions come in bundles!
? – From your perspective, are the philosophical questions academically discussed in this way still “big” questions? How do you see the future of these questions? Some of the big philosophical problems have been solved by science, at least to a 1st approximation. Examples: the problems of matter, and mind. Only philosophical reactionaries, like Noam Chomsky, claim that they are and will remain mysteries. Physicists and chemists know what matter is, and cognitive neuroscientists know that mental processes are brain processes. Of course much remains to know, but we know how to learn: through scientific research.
? – What is your opinion looking at the status of philosophy in society and culture today? What has become of the philosophical enlightenment? The slogan “liberté, égalité, fraternité“ is still much alive, but also incomplete, because it concerns only social life. In order to gain and enjoy freedom, attain and protect equality, and practice fraternity (or better solidarity), individuals must have jobs, and to hold jobs they must be healthy and reasonably well educated. Hence the 18th century triad should be completed with this one: Work, Health, Education. Contemporary philosophers are facing problems that were unthinkable only one century ago, such as whether space and time are mutually Independent, whether there is objective chance or only uncertainty, whether physics can explain chemical change, whether our behavior is fully determined by our genomes, whether ideation can change the brain, or whether either the economy or ideas are the ultimate roots of the social. A philosopher who is not curious about scientific news cannot tackle any such problems. Likewise with social problems, such as whether capitalism can be saved or whether, as John Stuart Mill and Louis Blanc proposed in the 1850s, cooperative ownership and management is preferable because it is more just and more efficient.
? – What is your assessment: Which of the ideals of the Enlightment have been implemented consistently and have been developed continuously? Where did progress came to a standstill? Where did it completely fail? What is the future of enlightened thinking? The Enlightenment was an enormous progress, but it was followed by the Counter Enlightenment, so that its ideals were not realized. Besides, we are facing new social problems, such as technological unemployment and environmental degradation, that were unknown two centuries ago. We need to revamp the Enlightenment once in a while. Opposing the Enlightenment because of its shortcomings, the way the Frankfurt school did, is as absurd as closing schools because they cannot teach everything that is known. Currently renowned intellectuals try to ban critical thinking: Traditional standardsshould be protected and not be”damaged” bycritical thinking– for this purpose philosophical rationalityand faith should be reconciled. MichaelSandelexpressed this ideain a recent interviewwith the German weekly newspaper “Die Zeit”-Jürgen Habermas argues for a”strict boundary between faith and knowledge,” and claims an “opaque core” of subjectivity which should be beyond the range of rational analysis.
? – How do you assess this suspension of rationaland philosophical analysis in favor of certain traditions – a trend describedby Hans Albert as “suspension of the use of reason” (“Beschränkung des Vernunftgebrauchs”)? I disagree. One should believe only what can be chosen to be true or just. Irrational (or unjustified) beliefs should be avoided because they can have disastrous practical consequences. Only the stupid and the wicked can fear rational criticism. – I agree with Albert, but I don’t believe that criticism is enough: we need to plant seeds in addition to weeding.
? – With that it mind, what is your opinion? What is the significance of empirical and scientific evidence for your philosophical thinking? I do not share Michel Foucault’s mistrust of science, because I reject his view that science is only politics through other means. Scientists are after knowledge, not power, and too many people in power fear (social) science because it may show that certain political groups serve special interests instead of the public good. Serious sociology of science, like Robert Merton’s, does not politicize science. I have nothing to fear from serious social studies of science, and I hope that my philosophy will help progressive science policies while showing that the most modern views of science are ignorant and regressive, even if they are accompanied by a leftist-sounding rhetoric.
? – In your view,what are theboundaries betweenphilosophy and science– which role do they play, respectively – and what is the name of the game they a playing? There is a continuum between science and philosophy. As Fichte said (but did not practice), philosophy should be the science of sciences. And as a few Philosophers have noted, scientific research presupposes some philosophical theses, such as that reality is intelligible.
? – Sciences seem to give all the important rational explanations of the world. What is it that philosophy can contribute that goes beyond scientific rationality and scientific expertise? Alcmaeon’s , that mental processes are brain processes. he first principle encouraged the search for invariants in change, the second helped look for systems in collections, and the third is no less than the mother of biological psychology (or cognitive neuroscience). Every day we can observe a “flood” of scientific reports. On a daily basis the AAAS publishes a variety of references tonew studies on http://www.eurekalert.org/. ?- What is the advice of a philosopher of science: How can laymen cope with this complexity and how can they find guidance to understand the world? Whereas scientists may remain satisfied with the latest scientific findings, philosophers may warn that it will always be too early to hail the latest as the last. For example, they may share the physicists’ wonder at the latest findings about single electrons and photons, but they may warn that theoretical physics has been stuck in unsolved problems, and that cosmology is still marred by myths such as the creation of the universe out of nothing.
? – Is philosophy still able to provide a “compass” which operates on the basis of stable assumptions? Is it compatible with the bulk of what is known? Is it supported by solid empirical evidence? Does it suggest new research projects? Does it threaten any basic social value, such as peace and wellbeing? Can it give succour to any of the enemies of moral and social progress?
? – Science does not always provide lay people with helpful orientation. Sometimes we read “sensational” science news that appear to be inconsistent and conflicting with what has to be regarded as serious scientific knowledge. Yes, it is scandalous the way some scientists accept uncritically some of the most ridiculous speculations, such as the plurality of worlds, the opinion that spacetime has more than 4 dimensions, that particles can move faster than light, or that human life can be prolonged indefinitely. Anyone with a scienific Weltananschauung will temper enthusiasm with caution. ?- What is the background of these speculations? Are there “scientific myths” at work? How can philosophy expose them and help to distinguish solid scientific knowledge from unrealistic legends? This is an interesting question that deserves to be pursued at great lengths in an interdisciplinary manner. However, one can discern a few very general myths that facilitate the birth of further myths: that everything is possible; that whatever we have failed to explain in normal and earthly terms must have paranormal or supernatural explanations; and that science, being rational, cannot explain the irrational, such as taste and love.
? – What lies behind such “scientific superstition”? One of the causes is the separation of science from philosophy: the belief that science Is self-sufficient. Another is the argument from authority. A third is the lack of historical perspective. In the World Congress of Philosophy held in Düsseldorf in 1978 you held a public debate with Sir John Eccles, the famous neuroscientist, a Nobel laureate, and collaborator of your friend, the philosopher Sir Karl Popper. Eccles held the idealist and parapsychological view that the immaterial mind keeps the neurons moving, much as the pianist plays piano. On the basis of neuroscientific knowledge you held the opposite: that minding is the specific function of the human brain. Congress participants were amazed by the toughness of your dispute. Sir John Eccles was a remarkable technician, the first to record the activity of single nerve cells thanks to the microelectrode he invented. Since he did not find the soul in the individual neuron, he jumped to the conclusion that the mind is immaterial. Many years earlier, in the prestigious weekly „Nature“, Eccles published a paper where he held that the neuron behaves the way it does because of the soul’s telekinetic action. Why was that paper accepted for publication? Because the editors did not have a filtering mechanism. And why did the famous philosopher Karl Popper support Eccles instead of criticizing him? Because he had no coherent worldview, and because his criterion of scientificity was purely empirical: he was satisfied with refutability, whereas most scientists demand also what I call external consistency, i.e., compatibility with the bulk of knowledge – in this Physics, since telekinesis involves the creation of energy out of nothing.
? – What response did you receive from your colleagues then? What did your friend Sir Karl Popper say, who favored dualism? Popper was not pleased: he told me he was pained every time two friends of his fought one another. Actually it was much more: his dualism was inconsistent with his own scientificity criterion, since it is irrefutable. And it does not enjoy the support of neuroscience. Several years earlier he had scolded me for writing that the steady-state theory of the universe, according to which there is creation of matter out of nothing to maintain a constant energy density despite the expansion of the universe, was magical. I do not know how other philosophers reacted, except in the case of Marxists. At the same congress, the editor of the Soviet philosophical Journal „Filosofskie Nauki“, a Professor Gott (sic) asked me for a contribution. I mailed him „The bankrupcy of psycho-neural dualism“, which he published along with a paper by a certain D. Dubrovsky, twice as long, that defended dualism. Why? Because Lenin had criticized Eugen Dietzgen’s thesis that the mind is material, alleging that, if this were true, materialism would be consistent with idealism. Shortly thereafter, something similar happened with the Hungarian Marxist philosophical review. But this time they asked Professor Szenghagothai, an eminent Catholic neuroscientist, to refute me. This was not an isolated incident: Marxists have not kept in touch with science, and they prefer to repeat their classics. It is easier and safer.
? – In the years following your participation in the World Congress of Philosophy you have worked out your monistic perspective on human consciousness in detail. Yes, in three books: „The mind-body problem“ (1980), which was translated into German; „Philosophy of Psychology (1987)“, and „Matter and Mind“ (2010). In each case I incorporated some new findings in neuroscience (e.g, about neural plasticity) and biological psychology (e.g., about the neural tracks left by learning).
? – What have you found out there? Is it possible to explain to laymen in a few words how human freedom is possible despite – or even because of – material processes in our brain and the absence of a nonmaterial mind? I believe that modern science supports free will, in showing that the brain can act spontaneously, not only in response to external stimuli. Of course you cannot free yourself from the laws of nature; but the laws of nervous systems are not the same as the physical laws. If we know that we have free will, then we will believe in our power to alter the status quo, though not arbitrarily, because society imposes restrictions on individual freedom: I will let you do as you wish as long as you don’t hurt me.
? – Obviously we now reach fundamental ethical questions. For example: Is it possible that sciences, which emphasize the crucial importance of empirical-scientific knowledge, find standards for morality and ways for their implementation in social life? Science is morally neutral, but social science shows us that some moral codes are better than others. For example, the societies that abide by the rule “No rights without duties, and no duties without rights“, is likely to do better than those that tolerate selfishness or that impose obedience.
? – What role do values ​​play? Do they strengthen morality? How do they work ​​in social life?
? – Who are legitimate moral authorities – who can intervene when people fight over interests and values? Under theocracies and other authoritarian regimes, the rulers are the moral authorities. Under genuine democracy some basic values are entrenched in the legal system, which is expected to be under democratic vigilance, and others are left to the person or the group, which ideally debate moral problems in a rational, free and cooperative manner. For example, doctor-assisted suicide should be a right, but each case should be discussed by all the interested parties: patient, his/her dependents, and health workers. Have religions gained even new power? Has their influence in societies of the West, East, Middle East etc been increased? And in the meantime – what has happend to the influence and status of philosophy? In some regions, such as North America and Japan, religion is on the wane: the temples are empty and the priesthood is discredited. But in others religion is stronger than ever, because it is used as a tool for the emancipation from the so-called West. This has been happening with Islam since the times of Mossadegh and Colonel Nasser.
? – Often it is argued – even by philosophers -, that religion and philosophical thought are compatible with each other. Some consider it reasonable that philosophy should respect the “higher” knowledge claims of religions. Dogmatic philosophy is certainly compatible with religion, and in some cases its surrogate. But since Greek and Roman antiquity, enlightened philosophy has been the bane of religion. No wonder, because genuine philosophers do not admit supernatural beings, after-life, revealed wisdom, absolution, or the absolute authority of religious professionals. The thesis oft the double truth, held by Averroes and resurrected by Stephen Jay Gould, is false from the viewpoint of scientism, according to which science can study everything, whereas faith blinds us. The same thesis also discourages us to hold groundless beliefs. However, we should defend religious freedom as long as organized religion does not attempt to usurp the right of the state, to secure universal, compulsory and free secular education.
? – How do you see the relationship of philosophy and religion? Is there a “higher sphere of faith”, which philosophy has to leave to religion? In the end – have we to believe in a world creating divine power, which reconciles us with our existence on earth, lending us the ability to understand the world? From a historical viewpoint, religion is just a kind of superstition, and from a political viewpoint it is a tool of social control. Authentic philosophy is secular: it accepts Kant’s dictum in his 1st Kritik: „Gott ist eine bloße Idee“. But a democratic state will protect the freedom to hold any beliefs other than those that harm others, such as racism. In particular, it will see to it that no one is harmed just because of her beliefs. How should we assess this “religious warfare” from a philosophical point of view? Is there a philosophical “peace plan”? How could it be used successfully? History and the sociology of religion suggest that all religious wars are political wars in disguise. Mohammedans live peacefully with Christians and Jews in Spain, Turkey and Northern Africa for centuries, until oil was discovered in Arabia, and British and American companies started to exploit it. Remember Mussadegh, the Iranian president who was toppled by British Petroleum Co, with the help of the American „intelligence“ agency, when he announced his intention to nationalize Iranian oil. Whom did the Americans put in power to replace him? The murderous Sha Reza Pahlavi. And Israel would not be just as hated as the US, had it not become America’s most loyal and effective ally. Neither the US nor Israel has ever supported any national liberation movement. In particular, Israel sent arms and military advisors to the Apartheid regime and to the worst Central American dictatorships. Oil, not religion, is behind the so-called “culture clash”. Likewise, Catholic France paid Lutheran Landsknechte to fight the Spanish-Austrian alliance. Ask Cardinal Richelieu whether he celebrated any masses for the souls of the Catholics robbed and massacred by the Lutheran soldiers in his payroll. Can philosophy do anything to solve this problem? No, because it is an economic and political issue, not a conceptual one. All philosophers can do is to abstain from helping the aggressors and to enjoin social scientists to tell the truth instead of joining the choir of liars and hypocrites. Until a few decades ago political philosophers had contentious issues that reflected the conflict between two power blocs – between East and West. – In your view – what has happened to the political philosophy since then? Few if any political philosophers have had the courage of tackling the Cold War. Even the best of them have kept silent or have stated some bromides glossing over the serious shortcomings of “our” side, such as racism, social injustice, extreme income disparities, the exploitation of the Third World, and environmental degradation. Was it because of ignorance or cowardice? I do not know, and it matters little. I favor integral democracy, that is, a radical expansion of political democracy to include biological democracy (gender and race equality), economic democracy (cooperative ownership and management), and cultural democracy (free access to education). This recipe has never been tried, though the Scandinavian countries are pretty near it. ?- Looking at the current situation: What do you think – is there a digital political revolution going on? – The Arab world is on the move. The “digital political movedness” of individuals and groups seems to play an important role. Looking at the sequence of revolutions – for example in Tunisia and Egypt – we recognize the importance of social media. The internet-supported information had worked as a instrument coordinating the activities of the critics of governments. In response today Islamic spiritual leaders openly condemn users of Twitter. In the West, people use the social media to get involved politically, to establish networks and to influence public opinion. As a response Western governments mistrust their citizens and instruct their intelligence agencies to spy on them. In addition, they appear to plan to restrict digital freedom massively. The new media help mobilize people, but they do not replace organization. Indignation is a passing mood of the individual, whereas organization is a lasting social endeavor. ?- What do you think: Emails, Twitter, Facebook, Tumblr, Google+, etc. – are they tools for the Enlightenment, of individual freedom – or rather of anti-democratic terror or even episodes of post-modern capitalism? I admire those technological marvels but do not use them because they make you believe that you have acomplished something by sending some smart messages to people who need more time to think and to engage in face-to-face interaction, which is essential for love, friendship, and collaboration. I pity the babies whose mothers are busy texting trivialities instead of playing with their children; I pity the children who are tethered to their cell phones instead of playing ball; I pity the adolescents who are wasting their best years holding one of those artefacts instead of the hand of another young person. All those electronic devices are weakening the social bonds. Sociologists and psychologists should study this serious threat instead of repeating that communication is the cement of society. Communication accompanies social transactions and can instruct or stultify, mobilize or intimidate, but it is no substitute for production, collaboration and fight.
? – By family ties, but also by teaching and working phases in the past, Germany is more familiar to you than to many other philosophers acting internationally. German idealist philosophies and their historical materialist adaptations seem still today fascinate people today: How do you interpret the fascination of Hegel and Co., for example, in the Anglo-American societies, which are characterized by individualistic lifestyles? Mainstream „Continental“ philosophy from the 19th century on has been Kantian (subjective idealism) or Hegelian (objective idealism), and occasionally a mixture of the two (Dilthey). Ironically, neither was born in Germany: subjective idealism was invented by George Berkeley, an Irish Anglican priest, and came to Kant via Hume, a Scottish skeptic; and objective Idealism came from Plato. Hegel’s great merit is that he tackled important problems; his great demerit is that he spearheaded the Counter Enlightenment: the reaction against clarity, rationality, scientism, and political progressivism. When Germany was split into two, two Hegel Gesellschaften, one pro-Marx and the other anti-Marx, were organized. But neither of them criticized Hegel’s confusions and attacks on modern science. In particular, both accepted and developed the dialectical absurdities. Once you believe that Hegel was „a mighty thinker“, as Marx did, you can believe that conflict beats cooperation, that the dictatorship of the proletariat will wither spontaneously, and so on. And if you believe that you understand Hegel, you can also believe that Husserl and his star pupil Heidegger were profound thinkers.
? – How do you assess the present importance of “German thinkers” for the international philosophical discussion? The only German philosopher who is well-known outside Germany is Jürgen Habermas, who in my opinion is superficial and long-winded. He has managed to skirt all the important philosophical issues generated by contemporay science, in particular atomic physics, evolutionary biology, biological psychology, an socioeconomics. His attempt to fuse Hegel, Marx and Freud has not resulted in a coherent system, and is not a research project. And his conflation of science, technology and ideology betrays his ignorance of all three.
? – From your perspective: What is the future of philosophies which are strongly influenced by national cultures? All genuine philosophy transcends national boundaries. Patriotic philosophies are just nationalist ideologies.
? – I would like to talk about your new book “Medical Philosophy – Conceptual Issues in Medicine.” – Your publisher writes: “probably the first medical-philosophical work, which systematically analyzes and discusses the basic concepts of medicine.” For many physicians and patients this title sounds a little irritating: Why does the medical domain need a philosophical discussion? What are pressing philosophical issues in the medical field? The most urgent task for a iatrophilosopher is to spot and denounce the pseudomedicines, such as acupuncture, homeopathy, and psychoanalysis. But the most important tasks are (a) to find out and analyze the ways doctors think, and (b) to evaluate the ways biomedical researchers evaluate therapies. ?- What aspects of medicine urgently need to be transferred to the philosophical “ICU”? Medical diagnosis, the design and trial of synthetic (man-made) drugs, and the ambivalence of the medical-industrial complex, which stimulates the search for better therapies while at the same time corrupting some medical practitioners. ?- For whom did you write this book – is it necessary for readers to complete some semesters of philosophy to be able to understand your reasoning and to use your suggestions? Nein! Ganz im Gegenteil (in German), because in a couple of semesters you can learn who said what, whereas learning to philosophize takes a lifetime. My book is addressed to the biomedical researchers and practitioners who regard medicine as an exciting field full of holes and pregnant with surprising research opportunities – just like engineering and management science. ?- What is your vision for the future of medicine? Just a continuation of the scientific medicine born in the Paris hospitals around 1800, the German medical and pharmaceutical laboratories born around 1850, and the European public health schools and movements born around 1900. Medical breakthroughs, yes, but medical revolutions, no, thank, you, except in places where modern medicine has not yet arrived.
? – Where do you get your inspiration and fun to publish a book almost every year? How do you manage this workload? Just curiosity and the belief that I can be of help. To me, work is not a burden but my main hobby. This is why I always take work with me when I go on holidays. Moreover, that’s when new projects occur to me: while contemplating beautiful landscapes or seascapes.
? – By now you are professor emeritus – you reached this status at the age of 90 years, almost thirty years later than it is usual at German universities. How important was your learning and working with students? It was very important, because young people often think out of the box and ask amazing questions. I miss that.
? – During my research I found out that you had founded a “university”as a young man. – Can you give us some background information – how this foundation came about, how you had organized this school? Where did your students come from? It occurred to me that I had the duty to give society something in exchange for the free education I was getting. My Arbeiter Universität taught industrial workers and trade-union organizers. We offered courses in mechanical, electrical and chemical engineering, as well as in Spanish language, history, economics, and labor law.
? – You grew up in Argentina, where you have started your career – since the sixties of the last century you have been publishing your books primarily in English and for decades you had taught at a Canadian university. – Looking at this internationally active life: How important are your “South American roots”? My Third-World roots remind me that the vast majority of our fellow human beings live hungry, sick, and uneducated, and that most social scientists, even in that world, ignore that ugly reality. This is why my papers in mathematical sociology deal not with free choice among 30 flavors of ice-cream, but with social structure, social cohesion, and social marginality. System ist nicht gleich System! In der Folge des vorliegenden Beitrags wird es nicht darum gehen, eine spannende Erörterung des Aussehens eines Bergmassivs oder einer anderen geologischen Merkwürdigkeit spannend zu umschreiben – was tatsächlich bereits ein schwierig zu meisterndes Unterfangen wäre. Hier wird es um etwas gehen, das sich noch öder, trockener auszunehmen droht: Es geht hier um einen der abstraktesten in Wissenschaft und Technologie verwendeten Begriffe – um den Systembegriff. Selbst die Empfehlung Vonneguts, einen Menschen in die Darstellung einer Sache einzubeziehen, droht angesichts massiver Unanschaulichkeit der betreffenden Sache unwirksam zu bleiben. Deshalb gehe ich die Herausforderung an, indem ich nicht nur einen Menschen, sondern direkt eine ganze Gruppe von Menschen in meine Schilderung einbeziehe und indem ich einen weiteren Kunstgriff nutze: Ich schreibe meinen Text in Form einer Reportage. Vom 22. bis 25. April 2014 fand in Wien ein internationales Treffen von Systemtheoretikern und Kybernetikern statt – das 22. European Meeting on Cybernetics and Systems Research (emcsr 2014). Veranstaltungs-Location waren Räumlichkeiten der Universität Wien – genauer: die der Kommunikationswissenschaftler auf der Währinger Straße. Die Organisation des Events lag in Händen der Mitarbeiter des „Bertalanffy Center for the Study of Systems Science“ einem eingetragenen Verein, der sich laut Satzung als Vereinigung zur Förderung der Systemwissenschaften versteht. Die Gründer des Bertalanffy Center haben ihrem Verein zum Ziel gesetzt, die Forschung der Allgemeinen Systemtheorie im Sinne Ludwig von Bertalanffys zu fördern. Zum Auftakt der mehrtägigen Symposien erfolgen zunächst Grußworte – Vertreter von Organisationen, die sich der Systemforschung verbunden fühlen und das diesjährige internationale Treffen unterstützen, stellen sich vor und grüßen wortreich die im Hörsaal anwesenden Teilnehmer der Veranstaltungswoche. Die Stimmung ist gut, die Beteiligten sind erwartungsvoll gespannt auf die anstehenden, hoffentlich interessanten Beiträge und Diskussionen der folgenden Tage. Eines der letzten Grußworte wird enthusiastisch mit einem “General system theory is rock ’n’ roll!” abgeschlossen – ein erster, ein emotionaler Höhepunkt des Tages. An die Grußwort-Zeremonie schließt sich eine Feierstunde an. Anlass: Das Bertalanffy Center verleiht zum zweiten Mal den “Bertalanffy Award in Complexity Thinking”. Der erste Preisträger war zwei Jahre zuvor anlässlich des 21. European Meeting on Cybernetics and Systems Research-Events der französische Philosoph Edgar Morin. Spätestens an diesem Punkt der Laudatio muss jeder, der sich ein wenig mit Bunges Werk auseinandergesetzt hat, den Atem anhalten – geht es doch um einen Preis, der ausgerechnet nach dem österreichischen Biologen von Bertalanffy benannt ist. Dies ist ein Augenblick allerhöchster fachlicher Spannung. Doch Zimmermann umgeht deren Auflösung, indem er den zum Greifen nahen Konflikt nicht anspricht, sondern stattdessen beschwichtigend betont, wie erfrischend er es findet, mit Mario Bunge heute einen Philosophen zu treffen, der „richtig“ zu diskutieren versteht. Die Leser, die kein besonderes Interesse an wissenschaftstheoretischen Fragen haben, werden sich nun fragen: Wieso den Atem anhalten, welche Spannung? Es handelt sich doch hier – wie bei Preisverleihungen üblich – um eine freundliche Rede, in der es vor allem um höfliche, wohlmeinende Worte und eine feierliche Würdigung der langjährigen Verdienste eines Preisträgers geht. Halten wir zur Klärung inne, verabschieden wir uns für einen Gedankengang aus dem Hörsaal in Wien und von der Veranstaltung an diesem frühlingshaft-freundlichen Dienstagmorgen im April, um das angedeutete spannende Element genauer zu betrachten. – Das ist angemessen, denn wie wir etwa aus der psychotherapeutschen Praxis allzu gut wissen: „Störungen und deren Auflösung haben Vorrang“. Exkurs: Systemismus und Holismus schließen einander aus. Bunge kennt Ludwig von Bertalanffys Werke offensichtlich recht genau und schätzt dessen persönliche Rolle als Mitbegründer der General Systems Research-Bewegung. – Kurze Rückschau: Im Jahre 1954 gehörte Bertalanffy in Stanford federführend zu den Gründern der Society for General Systems Research. Einer der Co-Gründer war übrigens der bekannte Mathematiker, Biologe und Musiker Anatol Rapoport. Darüber hinaus verweist Bunge in seinem Werk an verschiedenen Stellen auf von Bertalanffys bekannten systemtheoretischen Grundsatzartikel aus dem Jahr 1950: An Outline of General System Theory. Und genau hier kommen wir auf den gesuchten, konfliktgeladenen Punkt. Denn Mario Bunge übt Kritik an Bertalanffy Gedankengängen. Ganz deutlich schreibt er, dass dieser einen Systembegriff entwickelt habe, der das wissenschaftliche Konzept des Systemismus mit einem “Holismus” verwechselt. Lesen wir weiter, wird deutlich, dass aus Bunges Sicht hinter diesen beiden Konzepten zwei unvereinbare Ansätze stecken, auch wenn beide Begriffe vom Laien-Publikum häufig synonym verwendet werden. Holismus: Tatsächlich irreführend und tödlich? Worauf zielt Mario Bunge mit seiner Kritik konkret? Mario Bunges Argument kommt – wie nicht anders zu erwarten – aus wissenschaftsphilosophischer Richtung. Versuchen wir zunächst einzuschätzen, wie schwerwiegend eine solche Argumentation sein kann – also: Wie ernstzunehmend die darin liegende Kritik ist. Welche Relevanz hat eine philosophisch geführte Kritik – welche Konsequenzen ist sie zu erzwingen in der Lage? Anders gefragt: Philosophische Kritik, ist das etwas, vor dem sich ein Autor wie von Bertalanffy fürchten muss? Auf den ersten Blick könnte uns solche Kritik als eher irrelevant erscheinen und die Idee, Systemismus mit Holismus zu übersetzen, als durchaus akzeptabler Ansatz. Denn: Wenn wir heute überhaupt etwas mit dem Begriff anfangen können, dann ist für uns als durchschnittliche Mitglieder der modernen Mediengesellschaft die Domäne der Philosophie – sollte sie überhaupt einmal in den Blickpunkt geraten – so etwas wie ein netter Zeitvertreib ohne Belang für unser tägliches Handeln, unsere Arbeit, unser Leben oder gar unser Schicksal. Wo kommen heute philosophische Dispute überhaupt in das Licht der Öffentlichkeit? Die geschieht durchaus. Wenn in überregionalen Zeitungen – etwa in Wochenzeitungen wie in der in Hamburg erscheinenden „Zeit“ zur Sommer-Urlaubszeit Artikel erscheinen, die sich bemühen, „aktuelle philosophische Dispute“ ans helle Tageslicht zu bringen. Das Ressort, das sich hierfür typischerweise als Plattform bereithält, ist das sogenannte „Feuilleton” (franz. : „Blättchen“) – ein journalistischer Darstellungszweig, der laut Kommunikations-Wissenschaftlerin Claudia Mast „in betont persönlicher Weise die Kleinigkeiten und Nebensächlichkeiten des Lebens betrachtet und versucht, ihnen eine menschlich bewegende, erbauende Seite abzugewinnen“. Tatsächlich werden Philosophen in diesem Medienumfeld als Intellektuelle präsentiert, die es als Text-produzierende Individuen vermögen, ihre Weltsicht mit einer ebenso persönlichen wie “erbaulichen” Note zu verbinden. Am erfolgreichsten werden dabei philosophische Autoren vermarktet, die es schaffen, ihre exotisch anmutende Weltsicht so einfach zu vermitteln, dass diese für Feuilleton-Leser ohne anstrengende Eigen-Denkleistung und ohne philosophisches „Vorwissen“ konsumierbar wird. Der Genuss sollte dabei funktionieren wie eine eingefärbte Brille, welche die Leser in mußevoller Stunde – losgelöst vom alltäglichen Hier und Jetzt – einige Augenblicke aufsetzen, um für diese Momente eine kulturell-elaborierte Weltsicht zu genießen. – Schnell kann diese Brille wieder abgesetzt werden – das alltägliche Leben unbeschwert von Denkbalast, „normal“ fortgeführt werden. Ist das Auseinanderhalten dieser beiden Begriffe lediglich eine solche feuilletonistische Launenhaftigkeit ohne Nachwirkung und ohne belastende Substanz? Bunge würde diese Frage mit einem kategorischen Nein beantworten. Für ihn ist der Unterschied zwischen Systemismus und Holismus (der Ganzheitslehre) so wesentlich, als könnte dieser nicht nur über das Scheitern von wissenschaftlichen Theorien in der Forschungs-Praxis, sondern in Technik und Technologie gar über Leben und Tod entscheiden. Der Holismus beeinhaltet das Dogma, dass Systeme vor allem Ganzheiten sind und dass die darin enthaltendenen Bestandteile und Entitäten komplett durch die Gestaltung des System-Ganzen geprägt sind – dass das Ganze (gr. holos – „ganz“) die Prozesse in seinen Subsystemen von oben her (top-down) dominiert. So stark und bestimmend, dass die Vorgänge in seinem Inneren von unten her (bottom up) keine Auswirkungen auf die Ausprägung des Ganzen nehmen können, und es sich deshalb erübrigt, diese einer näheren Betrachtung zu unterziehen. Der soziologische Systemtheoretiker Talcott Parsons – obwohl er jahrzehntelang die internationale soziologische Theoriendiskussion beherrschte – verfehlte es tragischerweise, bedingt durch seine holistischen Konzepte, solide Erklärungen oder präzise Diagnosen sozialer Systeme, Gesellschaften oder gesellschaftlicher Entwicklungen an die nachfolgenden Soziologen-Generationen weiterzugeben. Niklas Luhmann, ebenfalls soziologischer Systemtheoretiker, „kultivierte“ den Holismus so weit, dass er die gesellschaftliche Realität von Individuen, die miteinander sprechen, arbeiten usw. komplett aus seiner Betrachtungen ausschloss: “Nicht der Mensch kann kommunizieren, nur die Kommunikation kann kommunizieren.“ Dass soziale Systeme und Interaktionssysteme durch Individuen „gemachte“ und durch ihr Verhalten bewirkte Dinge sind, die – wenn auch oft mit Mühen – von diesen Individuen verändert – „verbessert“ – werden müssen, weil sie ansonsten schwerwiegende Probleme auslösen, ignorierte er. Für die „Wartung“ solcher Systeme – Unternehmen, Institutionen, Arbeitsgruppen, Familien, Ehen usw. – Verantwortliche wären zum Nichtstun und zum Akzeptieren ihrer Probleme verdammt, würden sie den von Luhmann vertretenen Holismus tatsächlich praktizieren. Ernste Gesundheitsrisiken verursacht ein solcher Holismus in der Medizin, wenn ein „Heiler“ im Rahmen seiner heilpraktischen „Behandlung“, die „Konstitution“ und Befindlichkeit seiner Patienten ausschließlich „ganzheitlich“ behandelt, wie dies von „alternativen“ Heilpraktikern häufig praktiziert wird. Er hätte kein Interesse an den einzelnen, in der Regel versteckten Mechanismen, die im Körper zum Ausbrechen von Krankheiten führen. Er könnte das Ausbrechen und ungehinderte Ausbreiten von ernsten Erkrankungen nicht verhindern. Entsprechend katastrophal würde ein holistisch geprägter Mechaniker im Fall eines defekten Flugzeuges wirken. Auf die Tatsache, dass im Cockpit einige Warnlichter rot blinken, würde er reagieren, indem er die entsprechenden Leuchtdioden außer Funktion setzte, statt im Detail den Ursachen nachzugehen und nach versagenden Mechanismen etwa an Steuerung und Motor zu forschen. Dadurch wäre scheinbar die äußere Ordnung hinter dem Steuerknüppel in der Pilotenkanzel wieder hergestellt. Allerdings mit dem Risiko, dass das betreffende Flugzeug unvermeintlich beim nächsten Flug in eine bedrohliche Situation kommt. Aber ist Bertalanffy tatsächlich im beschriebenen Sinne Holist? Zumindest ist sein bekannter Aufsatz aus dieser Perspektive geschrieben. Bertalanffy nimmt an, dass es die Wissenschaft mit „isomorphen“ Gesetzen zu tun hat, die alle Bereiche der Welt, der Natur, der Gesellschaft usw. durchwirken. Aus seiner Sicht sind die unterschiedlichsten Felder der Realität von gleicher Gestalt und Struktur. Er glaubt, in ganz und gar unterschiedlichen Bereichen das Wirken identischer oder isomorpher Gesetze voraussetzen zu dürfen. Er hält dies für eine wohlbekannte Tatsache in der Physik, wo sich angeblich dieselben Differenzial-Gleichungen auf das Fließen von Flüssigkeiten, Ausbreiten von Wärme und Fließen elektrischer Ströme anwenden lassen. Als entsprechend “isomorph” deutet er Phänomene wie das Wachstum von Bakterien, das Wachstum von menschlichen Bevölkerungen oder das Wachsen menschlichen Wissens. Als ersten Grund führte er an, dass es zwar einfach sei, eine komplizierte mathematische Formel zu bilden – etwa eine komplizierte Differential-Gleichung aufzuschreiben. Mühsam sei es aber, für diese Gleichung Lösungen zu ermitteln. Aus diesem Grunde würden lediglich eine begrenzte Anzahl einfacher Differential-Gleichungen für die Beschreibung von Natur-Phänomene genutzt. Weil auf diese Weise in vielen Feldern der Realität immer die gleichen Formeln verwendet würden, müsste geschlussfolgert werden, dass diese verschiedenen Realitätsbereiche ähnlich strukturiert und entsprechenden Gesetzen unterworfen sind. Entsprechendes trifft seiner Meinung nach auf wissenschaftliche Gesetze zu, die nicht mathematisch formalisiert, sondern in Alltagssprache formuliert wären: Die Anzahl unserer verfügbaren intellektuellen Schemata sei zu begrenzt, als dass wir anders könnten, als diese immer und immer wieder auf Naturphänomene anzuwenden. Dieses Argument lässt mich an die Redewendung denken, die Mark Twain zugesprochen wird: “Wenn Dein einziges Werkzeug ein Hammer ist, wirst Du jedes Problem als Nagel betrachten.” So wie beim Düsseldorfer „Nagelkünstler“ Uecker jedes Kunstobjekt mit durchgängigen Nagelflächen belegt und dadurch „strukturiert“ erscheint, wären alle Phänomene der Wissenschaft durch die immer gleichen Denkstrukturen geprägt. Die Denkformen, die zur Welterfassung zur Verfügung stehen, sind so begrenzt, dass Wissenschaftler nur das erkennen, das sie im Verlauf ihrer Forschung in die Darstellung der Tatbestände von „oben“ her aus Denker-Perspektive hineingesteckt haben. Die Realität kann sich diesem Vorgang gemäß Bertalanffy nicht widersetzen oder widersprechen. – Dem Leser wird es nicht schwerfallen, in dieser Begründung eine Variante des oben beschriebenen holistische Denkens zu erkennen. Mit dem zweiten Argument versucht von Bertalanffy, die vorhergehende erste Begründung abzusichern. Das macht er so: Er gibt zu, dass die beschriebenen mathematischen Formeln und Denkschemata eigentlich nicht hilfreich sein können, wären sie lediglich fiktiv. Hilfreich könnten sie offenbar nur dann sein, wenn sichergestellt wäre, dass Mathematik und Denken in ihren wesentlichen Strukturen grundsätzlich mit den Dingen der Welt übereinstimmten. Und so in etwa formuliert Bertalanffy: Gesetze und Schemata wären nicht hilfreich, wenn die Welt – zum Beispiel die Gesamtheit der beobachtbaren Ereignisse – nicht so ausgestaltet wären, dass sie von vornherein dazu passten. Er meint, es wäre zwar möglich, sich eine chaotische Welt vorzustellen, eine Welt, die zu kompliziert wäre, um durch die relativ einfachen Schemata erfasst zu werden, die unser begrenzter Intellekt nutzt.Bertalanffy beruhigt die Leser: Glücklicherweise sei die „wirkliche Welt“ nicht von dieser Art, sei durchgängig “denkkompatibel” und erlaube uns die problemlose Anwendung unserer intellektuellen Konstruktionen. Er behauptet – um es etwas anders auszudrücken -, dass die Welt entsprechend unseres Denkens vorgeprägt ist und dass es deshalb eine durchgängige strukturelle Gleichförmigkeit von Denken und Welt gibt. Für Bertalanffy ist alles – unser Denken und unsere Welt – von oben herab ganzheitlich durch ein und dasselbe Muster bestimmt. Mit dem dritten Grund kommt Bertalanffy auf den Systembegriff zu sprechen. Er nutzt diesen, um diesmal sein zweites Argument abzustützen. Er nimmt an, dass dieser dritte Grund für den Isomorphismus der Naturgesetze der wichtigste seiner Erklärungsversuche ist. Er bestände aus der Einsicht, dass in der Welt allgemeine System-Gesetze gelten, die unabhängig davon wirken, welche konkreten Eigenschaften konkrete Systeme und ihre Bestandteile jeweils haben. Er formuliert in etwa so: „Wir können auch sagen, es gibt eine durchgängige strukturelle Korrespondenz oder logische Homologie von Systemen in allen Bereichen und Feldern der Realität. Das ist der Grund, warum wir isomorphische Gesetze in verschiedenen Gegenstands-Bereichen finden.“ Für Bertalanffy gibt es eine „systemisch-logische Homologie”, die parallel das Wesen der Dinge und des menschlichen Denkens bestimmt. Wem es in seinem bisherigen Leben, seiner Ausbildung usw. nicht vergönnt war, sich in Muße und Konzentration mit der Frage zu beschäftigen, wie es möglich ist, dass sich ähnelnde mathematische Ausdrücke parallel in vielen Realitätsbereichen einsetzen lassen, der wird an dieser Stelle möglicherweise einer zwischenzeitigen “intellektuellen, strukturellen Sinnkrise” verfallen: Ist es denn nicht richtig, dass die Welt Zahl ist? Ist es denn nicht so, dass „überzeugte“ Mathematiker deshalb so enthusiastisch von ihrer Disziplin sprechen, weil sie berechtigterweise annehmen können, dass sie mit ihren Formeln den Schlüssel zu allen wissenschaftlichen Gesetzmäßigkeiten in der Hand halten? Wir gelangen mit diesen Fragen in das Feld sogenannter “semantischer Theorien” – es geht darum, wie wir durch den Sinn unserer Annahmen Bezug nehmen können auf die Welt, auf die in ihnen befindlichen Strukturen und auf die darin ablaufenden Prozesse. Insbesondere beschäftigen sich diese semantischen Theorien damit, wie sich mathematische Konstrukte – beispielsweise die linearen oder exponentialen Funktionen, die in Wissenschaft und Technik angewendet werden – auf die Welt beziehen können. Die Antwort aus holistischer Perspektive, die mit der Philosophie des Idealismus verwandt ist und viel mit dem mittelalterlichen Universalien-Realismus oder Platons Ideen-Dogma gemein hat, ist, dass diese Konstrukte tatsächlich konstruktive Elemente der empirischen Welt sein könnten. Wir hätten mit dem mathematischen Modell in unserem Kopf oder auf dem Notizzettel, dieselbe Struktur erfasst, wie diejenige, die der Welt formend ihr Gepräge gäbe. Weil beides aus einer Quelle geschöpft sei, um zum einen die Welt zu formen und um zum anderen nach denselben Prinzipien die menschliche Sprache und unser mathematisches Denken durchwirke. Ein sich von diesem Holismus abgrenzender Systemismus, wie dieser beispielsweise von Bunge entwickelt wurde und wie er typischerweise von empirisch-wissenschaftlichen Forschern vertreten wird, arbeitet mit einer grundlegend anderen semantischen Theorie. Und die lautet auf den Punkt gebracht: Mathematische Modelle lassen sich deshalb auf die Welt anwenden, weil sie ontologisch neutral sind und deshalb in unterschiedlichen Kontexten unterschiedliche Bedeutung haben können. Diese Formulierung dieser Theorie ist aber offenbar zu knapp, um denjenigen Lesern, die eben noch angesichts Bertalanffys Isomorphismus-Gedankengang verwirrt waren, überzeugend klar zu machen, wie der Standpunkt dahinter zu verstehen ist. Aus seiner Sicht beschäftigt sich reine Mathematik nicht mit der realen Welt oder mit der Erfahrung, denn: Mathematische Beweise sind keine empirischen Beweise. Mathematische Objekte wie Reihen, Funktionen, Klassen, Mengen, Matrizen, die Boolsche Algebra, topologische Räume, Zahlensysteme, Vektorenräume, Differenzial Gleichungen sind lediglich gedachte, rationale Dinge – “entia rationis” -, zudem sind sie “entia ficta”. Das heißt, mathematische Modelle sind Fiktionen, verdanken ihr Erscheinen unserer Fähigkeit, Fiktionen zu gestalten. Folglich ist der mathematische Begriff der Existenz, der in mathematischen Existenzsätzen in der Mengenlehre auftaucht, radikal anders im Vergleich etwa zu der Behauptung: “Klaus existiert.”, bei der es um die reale und materielle Existenz eines früheren Klassenkameraden geht. Daher sind alle mathematischen Existenzbeweise – wie alle übrigen mathematischen Beweise – rein konzeptuelle Verfahren. Kurz gesagt: Die abstrakte mathematische Wissenschaft und mit ihr die Mathematiker haben es mit Fiktionen zu tun – ähnlich wie abstrakte Maler, Autoren phantastischer Literatur und Erschaffer von Trickfilmen, in denen sprechende Mäuse, Enten, Eichhörnchen usw. vorkommen. Der Unterschied besteht lediglich darin, dass mathematische Fiktionen nicht willkürlich formuliert sind wie Drehbücher für Trickfilme, sondern sie folgen mathematischen Gesetzen und können per mathematisch-logischer Beweisverfahren überprüft werden. Mathematik – aber auch die Logik – behandeln keine konkreten Dinge, sondern Konstrukte wie beispielsweise Prädikate, Annahmen und Theorien. Das erklärt, warum die Mathematik inklusive der Logik die universelle Sprache der Wissenschaft, Technologie und selbst der Philosophie ist und warum sie die am besten auf unterschiedlichste Bereiche übertragbare und einsatzfähigste aller Wissenschaften ist. Dabei ist folgendes zu beachten: Dadurch, dass mathematische Modelle „leer“ sind, und eine mathematische Formel – etwa eine der Differenzialgleichungen, die es Bertalanffy so angetan haben – nicht eher Teil der Physik oder einer anderen empirischen Wissenschaft werden, als dass sie mit faktischem Inhalt „angereichert“ werden. Die Mathematik hat so betrachtet große Vorteile. Dazu meint Bunge: Die Mathematik wäre ein großes, üppig ausgestattetes Warenhaus mit gebrauchsfertigen Modellen, auf das Wissenschaftler, Technologen und Geisteswissenschaftlern zugreifen können, um die Strukturen und Prozesse in ihren jeweiligen Interessensgebieten abzubilden und zu analysieren. Der fiktionale Charakter der Mathematik ist Ursache dafür, dass ihre Modelle zwar als Werkzeuge gute Dienste tun, aber letztlich die Realität nur grob wiedergeben können. Bunge verweist in diesem Zusammenhang darauf, dass Mathematik präzise ist oder präzisierbar ist, während sich die reale Welt oft als chaotisch, schattenhaft und unklar, mit „unsauberen“ Rändern versehen erweist. Mathematik spiegelt die Realität nicht auf exakte Weise: Es gibt einen Bruch zwischen den beiden. Denn zum einen werden mathematische Konstrukte von Anwendern interpretiert, als besäßen sie eine autonome Existenz in einer Sphäre oberhalb der wandelbaren realen Welt. Zum anderen sind mathematische Modelle nicht geeignet, die in der Empirie verbreiteten Unregelmäßigkeiten und Unreinheiten zu erfassen. Zudem haben viele – wahrscheinlich die meisten mathematischen Konstrukte kein passendes Pendant in der Realität – es gibt nichts, was ihnen in der Realität vollständig und in allen Aspekten entsprechen könnte. Bunge sagt es metaphorisch: Dem Handschuh (der Mathematik) fehlen Finger – außerdem ist er nicht eng genug, um der Realität 100prozentig angepasst zu sein. Zurück am Veranstaltungstag: Nach der Laudatio spricht Mario Bunge. Zurück zum 22. April – direkt wieder hinein in die Festveranstaltung. Laudator Rainer E. Zimmermann hat seine Laudatio abgeschlossen. Mario Bunge übernimmt es nun, die Keynote für den Veranstaltungstag zu sprechen. Er nimmt zentral vor dem Auditorium, nahe des zentralen Whiteboard Platz, um im Anschluss während seiner Rede wichtige Konzepte auf der Tafel zu skizzieren. Die Leser des vorliegenden Beitrags sind nun gespannt darauf zu erfahren, wie das Konzept seines Vortrags angelegt haben mag. Dazu sei direkt verraten, dass Bunge sich nicht scheut, sein systemisches Konzept deutlich herauszustellen und damit eine grundlegende Gegenposition zu dem einzunehmen, was die meisten Zuhörer als überzeugte General System-Theoretiker vertreten („He takes no prisoners!“). Aber: Unhöflich wird Mario Bunge deshalb durchaus nicht. Denn er verweist auf den Mitbegründer der General Systems-Bewegung und Kollegen Bertalanffys, auf Anatol Rapoport. Darauf, dass Rapoport als Mitinitiator der General System Theory übereinstimmend mit Mario Bunges semantischer Theorie die Ansicht vertrat, dass die Systemtheorie keine Theorie im eigentlichen Sinne ist. Rapoport war der Ansicht, dass der Systemismus stattdessen eine Sichtweise, ein Approach ist, der hilft Probleme zu erfassen und diese in ihrem realen Kontext zu betrachten. Das funktioniert, indem Systeme, ihre Komponenten, Subsysteme, Strukturen und Prozesse mit Hilfe einer Kombination von Bottom-up- und Top-down-Untersuchungs-Strategien analysiert werden. Damit hebt sich Rapoport von einer holistischen Interpretation des System-Begriffs ab, der beschränkt ist auf Top-down-Betrachtungsweisen und deshalb – wie wir uns gerade vergegenwärtigt haben – nicht zu den Vorgehensweisen empirisch-wissenschaftlicher Forschung passt. Die Wirkung von Bunges Worten? Wie wirken diese Hinweise auf die hier versammelten Systemtheoretiker? Werden sie ignoriert oder wird ihnen per Gegenrede begegnet? Am Ende von Mario Bunges Vortrag wird deutlich, dass seine Botschaft tatsächlich bei den Zuhörern angekommen ist. Das zeigen die nun aus dem Publikum heraus gestellten Fragen. Einer der Zuhörer vergewissert sich noch einmal, ob er Mario Bunges Position tatsächlich richtig verstanden hat und dieser eine Gegenposition zur gängigen allgemeinen Systemtheorie vertritt. Mario Bunge bestätigt dies und stellt noch einmal heraus: Es kann keine allgemeine Systemtheorie und keine allgemeinen Systemgesetze geben. Forscher haben stets empirische Systeme zu untersuchen und hier nach den konkreten Mechanismen zu suchen, die hier wirken. Um diese Mechanismen zu erklären, müssten Forscher jeweils auf eine Vielzahl weiterer Theorien und Hypothesen zurückgreifen. Allgemeine Systemgesetze, die unabhängig von konkreten Erklärungsfall einsetzbar wären, sind Hirngespinste. Ein anderer Zuhörer hatte verstanden, dass Mario Bunge den Systemismus vom Holismus abgrenzte. Um sich den Grund hierfür noch einmal erklären zu lassen, stellte er die Frage, wie das möglich sei, angesichts der unter seinen Kollegen verbreiteten Annahme, dass der Holismus ein wesentlicher Bestandteil einer Systemtheorie sei. Mario Bunge erklärt noch einmal die Probleme des Holismus und dessen Beschränkung auf Top-down-Betrachtungsweisen. Dabei stellt er heraus, dass der Holismus eine uralte Philosophie sei, ein Denkmuster, das häufig von Mystikern gepflegt und zu mannigfaltigen Mythologien ausgearbeitet wurde. Der Preisträger des heutigen Tages konnte offenbar mit seiner Botschaft zu den Teilnehmern des Kongresses vordringen. Der eine oder andere mag vielleicht den Impuls bekommen haben, seinen eigenen Systemismus einer Probe zu unterziehen und diesen mit den Standards abzugleichen, wie Bunge diese in seinem umfassenden Werk gesetzt hat. „Roll over Bertalanffy, tell Parsons and Luhmann the News! *: Kurt Vonnegut Jr., Slaughterhouse-Fife or The Children’s Crusade – A Duty-Dance with Death, New York 1968. Bertalanffy, Ludwig von; “An Outline of General System Theory”, in: British Journal for the Philosophy of Science, Vol. 1, No. 2 (Aug., 1950),S. 134-165. Berry, Charles Edward Anderson; „Roll Over Beethoven“, Chess Records 1626, Chicago 1956.